Well not really - I don't have a yard, so nowhere to plant roses. But they ARE in my stitching! Got started on Rose this week, and I LOVE these colours, which are Belle Soie Rosebud and Collard Greens. And of course the fabric is my old favourite, 40ct Magnolia from Lakeside. 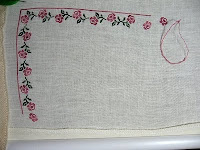 I have to say, after two projects on 32ct, it's soooooo wonderful to stitch on 40ct again. 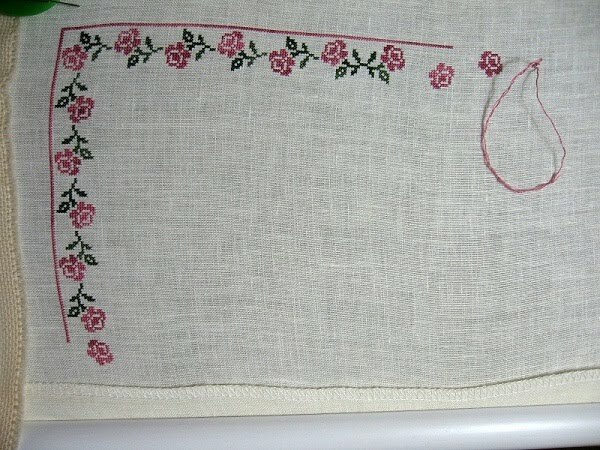 I love the tiny little stitches and the delicacy of the motifs! I would have more stitched but the darned frogs have been to visit this week. I'm not surprised, we drove the through swarms of them the other night and I think I few hitched a ride home with us! Hopefully they're bored with me now, I KNOW I'm bored of them. We have a Nate free few days, he's off to stay with his new girlfriend for a few days. Her parents are really looking forward to meeting him. I know we really enjoyed having her here a couple weeks ago! While he's only 18 and I don't want him settling down YET, I have to admit I really like this girl and I hope it lasts. For one thing, she actually eats!!! She's very polite, great sense of humour and it's obvious she adores Nate.